We all have something to overcome, something that scares us, something that pushes us to succeed. Maybe that’s all one thing, maybe they’re all separate – whatever it is, we are created to have a drive…to achieve. It’s part of what makes us human. For me, that drive often stems from fear. That’s right; I’m a semi-recently converted runner. It’s something I love, it’s something that allows me to push myself past any boundaries that I think exist or that I’ve set for myself. It’s freeing and allows me time to connect with not only myself, but with a community built on running and God’s creation that surrounds me with every step. The big secret? It’s also something that scares me to death. That’s right. To a certain extent, running terrifies me. There’s a background to this that I’ll try to sum up as best as I can. Because I wasn’t raised a runner, and because I was raised with multiple injuries and health situations that should limit my ability to run, I’ve been told and have believed that running just wasn’t for me. In fact, it was never an option when I was growing up that was presented to me. I could do other things…but not running. That fear was confirmed last May. 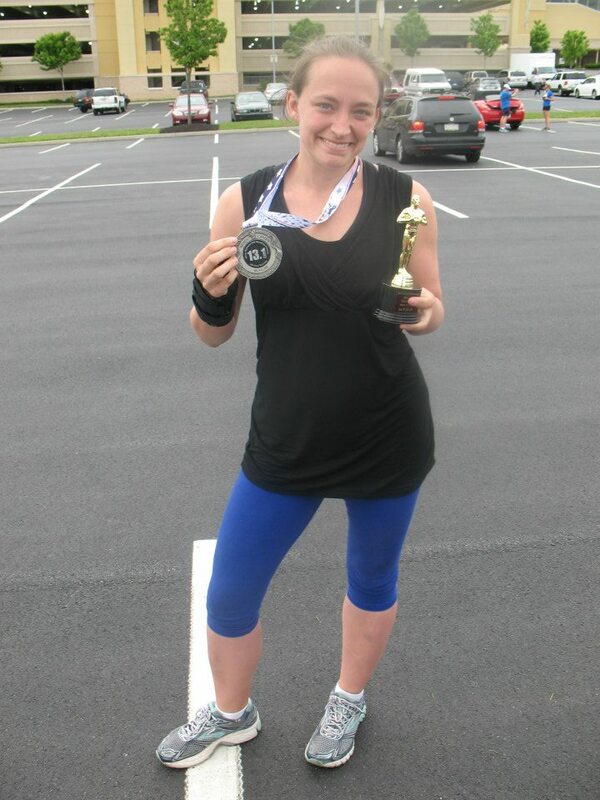 I ran the Grantville Movie Madness Half Marathon. I set a personal PR and couldn’t have been prouder. Check out this photo, holding my prize made me feel like I’d overcome a lot, and that I’d succeeded. It was great…until it wasn’t. You see, a lot of people don’t hear the second part of the story. The part where I ended up in the ER that night severely dehydrated, malnourished and pushed past what my body was able to handle. That I collapsed as soon as I walked in the door in what was an actual emergency. It’s important that I pause here to give a few details. I had recently been diagnosed with Celiac disease along with multiple food intolerances, which had all been cut from my diet. I was also super focused on losing weight, not always in the most healthy way. Even further, based on the diet changes, I panicked that morning, eating only a few scoops of peanut butter and didn’t pack food for the finish, forgetting that I probably wouldn’t be able to eat what was available. It was a storm of terrible circumstances and decisions that could have been catastrophic. As time passed, I stopped looking at the combination and started associating my running with that end result. This led to a fear that ran deep. This past fall, I decided I needed to overcome that fear and registered for my first half marathon since then…the Rock n’Roll Half Marathon in Washington, D.C. this Saturday. It’s almost here and boy are my emotions mixed! I can’t wait to go out there and face my fear with a healthier outlook on life, nutrition and running. But, during quiet times, I start to doubt. That’s what fear does – it creeps in when we least expect it and makes it really hard to see past it to reality. In those times, I do what I think everyone should do when faced with a fear: I rationalize it. I remind myself of the circumstances surrounding what happened last time. I tell myself that I have come a long way and that I HAVE prepared for this event. I put it into perspective and I use it to fuel my determination. I am ready for this. I have prepared myself mentally for this race. I can do it. But, even with all the focus and positive affirmations in the world, the fear still lingers. This Saturday, I will be facing my own personal demon…and I couldn’t be more ready. How do you handle the stressors in your life? What do you fear? Regardless of what they may be, it’s time to put them in the past. To replace them with truth and to push forward to become what you’re meant to become. Maybe that means dropping whatever’s been holding you back. Maybe it means setting a big goal and taking baby steps to accomplish it. Maybe it means asking for help. This is your call to action. It’s time to knock down walls and move forward; you’ve got this! Rock n’Roll USA Half Marathon – Washington, D.C.